I saw in Vermont they elected this goat, Lincoln, as Mayor. Unclear by his name if he’s a Democrat but he certainly has a much better chance than most the 2020 candidates. I enjoy a fun fight and I’m really looking forward to the Democratic primaries. It’s going to be hilarious to watch them try to out-PC, out-left each other. They’ll start off all nice like their anti-bullying bullying, but soon the field will descend into attack politics. Like Bernie and Hillary, they’re all playing nice until they’re not. Recognizing they fail by playing Mr. / Mrs. / Non-binary Good Guys / Gals / Them they’ll start chewing away at each other. I’m thinking at least we wouldn’t have to listen to the goat poorly attack his rivals. The only thing it would eat is the stage and perhaps gnaw away at a pant-leg here and there. And certainly Lincoln might also have a chance against Trump. He won’t get pulled into Trump’s obvious attacks. The most he can do is bah back. And not giving Trump the attention he so desperately craves, he may eat away at him a little too. The Democrats could do the same if they learned a little about winning. 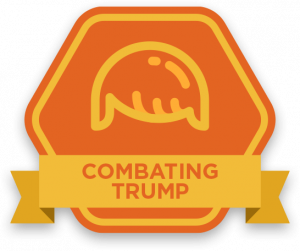 And a lot about defending against Trump’s attacks, and attacking him in the right ways. The Democrats attack like the dorky kid at the front of the class trying to sound cool. Yet if they learn a thing or two it would make it more fun for us, and perhaps even give Trump a run. I know they have this all figured out—hahahahaha—but I’m doing my best to even the playing field. P.S. I’m considering working with Lincoln but haven’t yet taken on a winner, so my $5,000,000 offer is still open.